Jim earned the distinction of being the only quarterback in Raiders history to never lose a game. 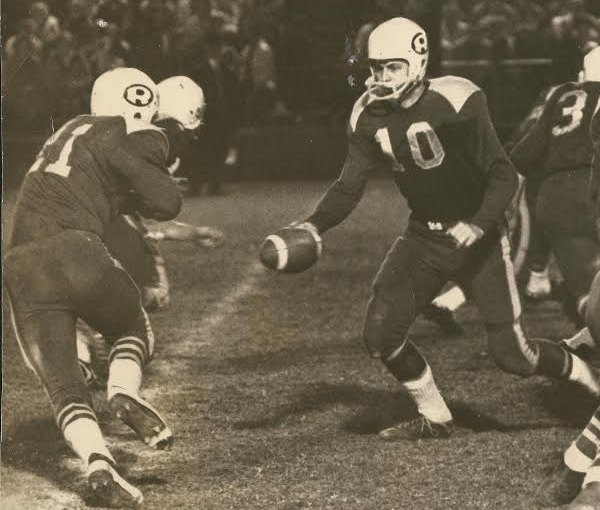 Playing for two years under coach Harry Gilbert, Jim led the team to back-to-back 11-0 records and two Central States Football League (CSFL) championships. One of Jim’s most memorable moments came with a 97 yard TD pass to tight end Ron Anton, a league record that held up for six years. Another is beating Elmhurst for the CSFL championship. Jim, who was named the leagues MVP after the 1965 season, worked in Johnson Wax’s corporate public relations office for 34 years before recently retiring. He and Carol, his wife of 41 years, have seven children and twelve grandchildren. Jim’s number was retired in 1988.